The kidney stent is one of several types of stents used in treating patients for various disorders. The stent most familiar to the general population is the one placed in a coronary artery to reduce blockage or to open the vessel should it become narrowed by the presence of plaque. The stent in this case consists of a wire mesh which is inserted into the artery and then expanded to open the blockage. Description And Purpose - The kidney stent is made of a flexible plastic rather than metal, and is placed in the ureter, the pathway between the kidney and bladder. The purpose of the stent is to allow the flow of urine which has for one reason or another become restricted or blocked. 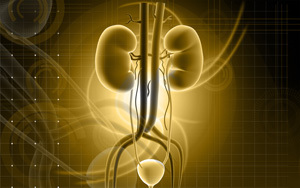 The stent performs the function of keeping urine from backing up into the kidneys. Blockage in the ureter is typically caused by kidney stones or stone fragments settling in the ureter, narrowing of the ureter wall because of infection, injury, or surgery, the presence of tumors in the ureter, or pressure due to an enlarged prostate. Unlike a coronary stent which is generally left in the patient, a kidney stent is almost always a temporary solution, and is removed once the problem with the urinary tract has been resolved. The physical characteristics most kidney stents are that they are tubular, typically 9 to 12 inches long, and with a coil at either end. As the stent is inserted into the ureter, one end is placed in a kidney and the other end in the bladder. The coils serve to help keep the stent in place. A patient who has a stent in place will most often be aware of it, though any discomfort felt is generally mild. Most typically, once a kidney stent has been inserted, the patient feels that the bladder is never quite empty and also feels a need to pass urine more frequently than normal. The patient may pass some blood along with urine for a period of time after the stent has been inserted, and may also feel pain when urinating. This situation will normally improve with time. Although a person with a kidney stent is usually able to lead a very normal life, care must sometimes be taken in performing certain physical activities, as pain may be felt and there is always the possibility of a stent being dislodged. A kidney stent can also become encrusted or cause infection in the urinary tract. Encrustation has at times caused blockage in a stent, the condition the stent was designed to avoid in the first place. Recently, most kidney stents which have a special coating have been put into use, reducing the chances of encrustation and blocking, and infection. Stent Insertion And Removal - A kidney stent is inserted while the patient is under general anesthesia, with the insertion accomplished with a telescoping tool called a cystoscope. This tool is first passed through the urethra into the bladder. Then the stent is passed through the bladder and ureter into the kidney. An x-ray is generally needed to confirm the stent has been placed correctly. The cystoscope is again put into practice when it's time to remove the stent. This procedure generally does not take long, and the patient is usually given a local rather than a general anesthetic. Some stents have threads attached which stay outside of the body and can then be removed simply by pulling on the thread. A local anesthetic would still be administered to perform this type of operation. Although a patient may experience a certain amount of discomfort at times once a kidney stent has been inserted, the device is worth its weight in gold in terms of the function it performs. A blockage, even a partial one, in the urinary tract can have very serious complications, which the stent more often than not is able to prevent.